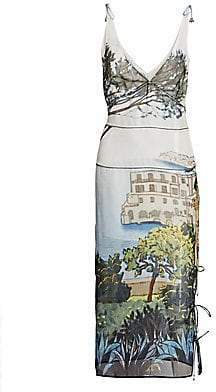 From the Saks It List: Retro Prints This eye-catching sleeveless dress is constructed of lightweight, flowing Italian silk. With self-tie details at the shoulders and hem, along with the colorful landscape print, this would be an ideal warm-weather evening look. V-neck Sleeveless Self-tie shoulder straps Self-tie split hem detail Silk Dry clean Made in Italy SIZE& FIT Cold shoulder dress About 56" from shoulder to hem Model shown is 5'10" (177cm) wearing US size 2. Designer Collec - Altuzarra. Altuzarra. Color: Blue Multi. Size: 36 (4).